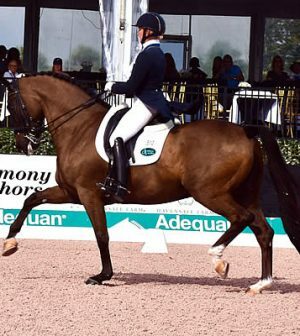 Wellington, FL (February 3, 2017) – International Grand Prix dressage rider and trainer Katherine Bateson-Chandler has made a powerful comeback with her primary dressage partner, Alcazar (known to Bateson-Chandler as “Lonzie”), at the 2017 Adequan Global Dressage Festival. 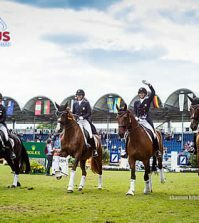 The duo had much to celebrate after completing their first ride this year at the Adequan Global Dressage festival, where they achieved a personal best score of 71.88 percent in the CDI-W Grand Prix. 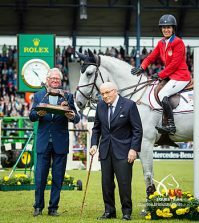 This was their first time competing together since Alcazar underwent colic surgery in July while the two were in Aachen, Germany to compete in the 2016 World Equestrian Festival CHIO. Last July, Alcazar, a handsome, dark bay Dutch gelding owned by Jane Forbes Clark, suffered from colic after the pair completed their Grand Prix ride at the World Equestrian Festival CHIO in Aachen. Alcazar underwent a successful colic surgery, and the two have been working patiently towards his recovery and rehabilitation since. Bateson-Chandler’s long partnership with Alcazar (Contango x Polin, Ferro) began in 2012 when Forbes Clark bought the seven-year-old gelding (who had competed in the prestigious Pavo Cup as a young horse) for Bateson-Chandler to train to Grand Prix level. 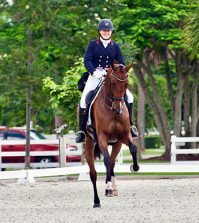 Bateson-Chandler trains with U.S. Olympian Debbie McDonald during the winter months in Florida. In the summer, she and her horses travel to the United Kingdom to compete and train with British Olympic Gold Medalist Carl Hester. Bateson-Chandler’s love of horses and passion for the sport of dressage began at the early age of sixteen, when she started working as a groom for Olympian (and now U.S. team coach) Robert Dover. Patience, dedication, and hard work have been distinctive hallmarks of her career, as she gained invaluable experience accompanying Dover to two World Championships and two Olympic Games, and eventually worked her way up to be his assistant trainer. Upon Dover’s retirement from competition in 2005, she took over the ride on his horses. Bateson-Chandler’s many successes over the years include being a member of the 2016 Gold Medal Dutta Corp. U.S. Team at the FEI Nations Cup, and being part of Team USA at the 2016 CDIO3* Odense Nations Cup in Denmark. In 2010, riding Nartan, she represented the U.S at the Alltech FEI World Equestrian Games in Lexington, Kentucky. The team finished fourth and, individually, she and Nartan qualified for the Grand Prix Special. She is now vying for a spot on the U.S. team at the World Equestrian Games to be held in Tryon, North Carolina, in 2018. Today, through her business KBC Dressage, Bateson-Chandler offers training and coaching services where her international experience ensures that students and horses have the competitive edge necessary for success in the dressage ring. She also offers dressage prospect selection for clients. 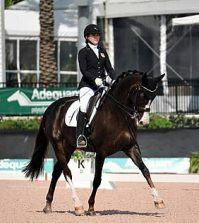 For more information about Katherine Bateson-Chandler, visit her on Facebook and on the web at www.kbcdressage.com.